Oh She Glows Every Day Cover Reveal + Pre-Order! 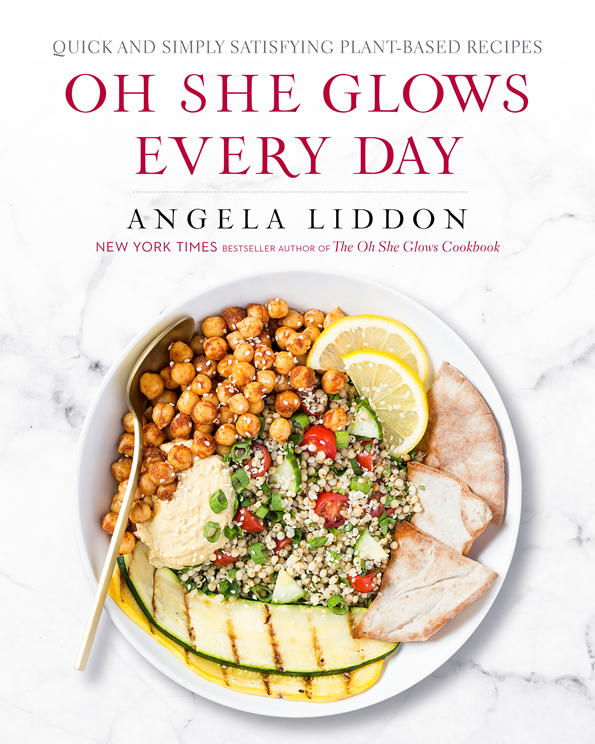 I’m soooo excited to reveal the cover for my second cookbook, Oh She Glows Every Day, and tell you all about this labour of love. Those of you who subscribe to In the Glow got a sneak peek last Tuesday, and today’s post features even more details and photos! 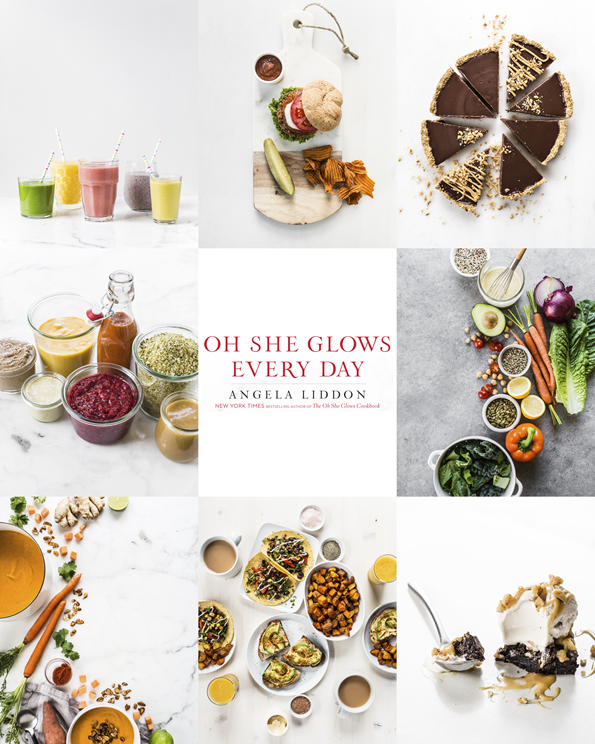 Oh She Glows Every Day is filled with delicious, wholesome, and accessible plant-based recipes. As someone who is self-employed with a young (and growing!) family, I’ve really come to appreciate recipes that are family-friendly, super energizing, and convenient for on-the-go lifestyles. (But really, who doesn’t?) 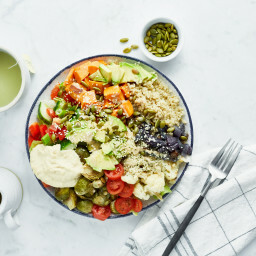 Inside, you’ll find over a hundred glow-worthy plant-based recipes—including a mix of “everyday” and more elaborate holiday or special occasion options. I’ve poured my heart and soul into each recipe (as did my dedicated group of recipe testers), and I can’t wait for you to start enjoying them with your family and friends! Left to right: Hemp Seed and Sorghum Tabbouleh, Meyer Lemon Cheesecake with Strawberry-Vanilla Compote, Creamy Thai Carrot Sweet Potato Soup, Protein Power Rainbow Quinoa Salad, Eggplant Parmesan with Fail-Proof Marinara Sauce, Glowing Rainbow Smoothie Bowl, Sun-Dried Tomato and Garlic Super-Seed Crackers, All-Purpose Cheese Sauce, The Best Marinated Lentils. One of my very favourite things about this cookbook is that it includes useful tips that will help you create meals that are kid-, allergy-, and freezer-friendly. Each recipe will tell you whether it’s gluten-free, nut-free, soy-free, oil-free, grain-free, kid-friendly, and/or freezer-friendly (or whether I provide an option for you to make it so). It’ll also tell you if advance preparation is required (such as soaking nuts). Out of more than 100 recipes, you’ll find around 65 kid-friendly and kid-friendly-option recipes (yes, we had a whole group of kids eating their way through this book! ), 100 gluten-free and soy-free recipes or recipe options, over 75 nut-free and nut-free-option recipes, and 45 freezer-friendly recipes. There are around 25 reader-favourite blog recipes (all re-tested and tweaked to perfection). And of course, all of the recipes in the book are plant-based and vegan. I developed the recipes to be as accommodating for different needs as possible without sacrificing flavour one bit, and I’m quite proud of the various options offered. There’s a highly detailed reference section at the back of the book on essential pantry ingredients, so you’ll know exactly what I’m using in my own kitchen. 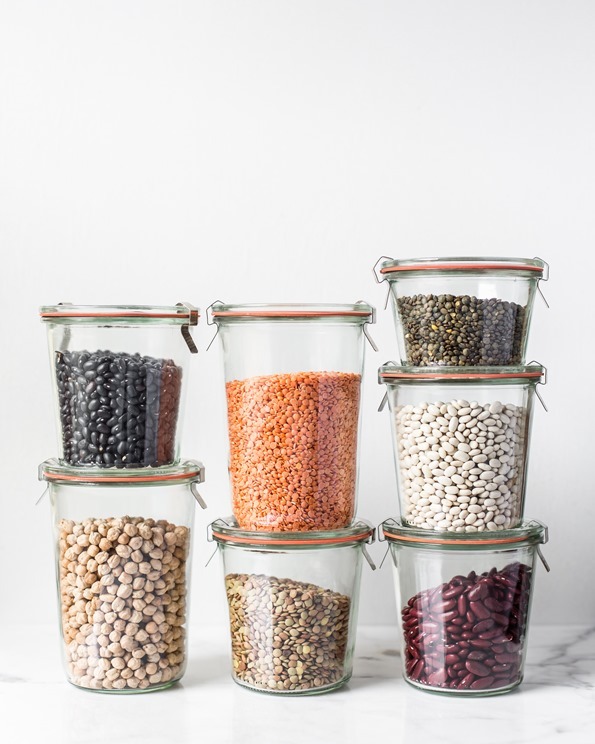 If you’ve ever thought to yourself, “I just don’t know where to begin,” or “I’d like to get out of a cooking rut and try something new,” this pantry primer is for you. 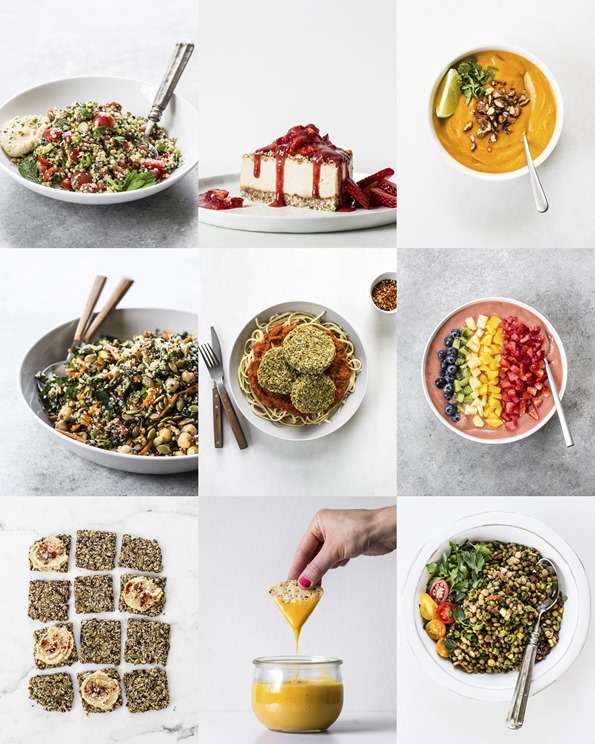 OSG Every Day is packed with gorgeous full-page photography for every single recipe in the book (as well as tons of lifestyle and pantry photos, too) that’ll inspire you to get cooking. (All of the pantry staple recipes have photos this time, too!) I have a sneaking suspicion that you will be blown away when you see how many vibrant photos are packed into this book. A special thanks to Ashley McLaughlin and Sandy Nicholson for lending their amazing talents!! I get a lot of requests for nutritional information, and I’m happy to let you know that the nutritional info for the recipes in this book will be available on my website by the time the book launches (September 6, 2016). The link to the nutritional info is in the book, and of course, I’ll share it here when the time comes. Last but certainly not least, let me tell you a bit about the cover. (Some of you may have noticed the cover on The OSG Recipe App and in a few online retailers in recent weeks!) 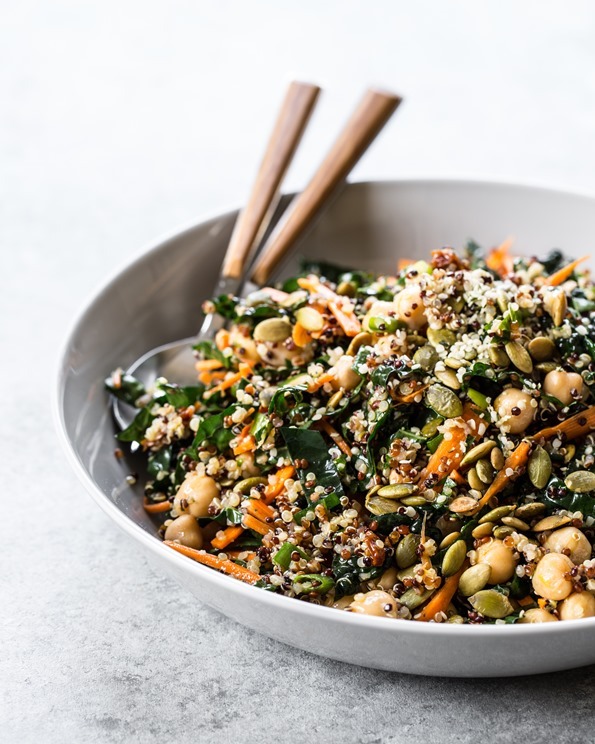 I love that it features a hearty plant-based bowl (a brand new recipe called “The Big Tabbouleh Bowl”) because it showcases what I love to eat at home, and reflects my philosophy that healthy food doesn’t have to be complicated, hard to find, or expensive. What’s also exciting is that the Canadian and US covers are the exact same this time around (in terms of the cover photo/design, as well as quality! ), so you’ll see identical covers whether you’re in Barnes and Noble or Indigo or any independent retailer across North America. The interior content is all the same once again. Lastly, the book will feature an improved, sewn binding that is durable, especially for “everyday” use! As you can see, there’s A LOT to celebrate!! I’m often asked why someone would pre-order a book rather than waiting until the release date. The best part is that if you pre-order now, it’s done: the book will arrive on your doorstep right away when it’s released. (Don’t worry, though—you won’t be charged until the book ships!) That means these recipes get into your belly as quickly as possible! I’d like to thank you all for your excitement and continued support, which makes what I do every day so incredibly rewarding, and of course for making The Oh She Glows Cookbook an international bestseller. I have no doubt that if you enjoyed the first book, you’ll fall in love with the second. Eric and I also put together this short video on the book. (It’s in a square format for social media sharing.) Check it out below! Congratulations!!!! The books looks beautiful!! I am heading over to amazon to pre-order :) …I cant wait to see it, it looks like so much hard work went to it!!! Thank you for everything you do! Huge congratulations, Angela! I’ve followed your blog for so long, it’s so wonderful to celebrate your success. The book looks great! Lisa, I’m honoured to have you reading for so long. Thanks for your congrats! It all looks great! Is it going to be the same cover for the US and Canadian edition this time? Look forward to seeing some new recipes. Ooh congrats and thanks for the sneak peek! I already pre-ordered when I saw it was an option on Amazon, but I’m so happy to see a bit more about the book today and all the drool-worthy photos. I’ll have to check my subscription to your newsletter, I was so sure I was signed up but didn’t get it recently! With summer here, its so much easier to get my husband to eat plantbased and he loves your roasted potato and asparagus salad and the caulipower alfredo! Sooooo excited!!!! Preordered as soon as I could not only for myself but as a birthday gift for my sister who will be celebrating within a couple weeks from the release!!!! Congrats Angela on what looks to be a beautiful and likely flawless product! So excited!! I’m so excited for your new cookbook! I read your first cookbook, oh she glows like the bible! I absolutely love all your recipes and CANNOT WAIT to try your carrot and sweet potato soup! I’m already in love? Congrats on all your amazing accomplishments! You are super awesome!! Congratulations! This new cookbook seems full of promises and is very beautiful! Congratulations! Thank you for all you do! I cannot wait to hold this in my hands and make all the recipes again! I still go back to your google docs and cook from those pretty frequently. ;) Congrats, girl! A million congrats to you! You deserve every success! Oh my goodness. I’m so beyond excited for this. Congratulations on the new book!! it looks like its going to be amazing! Congratulations!! I cannot wait to start cooking from this cookbook! I am loving the photography for the book. It’s very streamlined and classy. 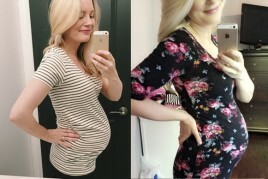 :) I have followed your blog since almost the very beginning, and am so excited to see your success. So excited for this book! I actually pre-ordered it quite a bit back, since I pretty much sustain myself on your recipes! I’m really excited about you offering the nutritional information with this book. I’ve actually lost over 100 pounds through calorie counting and eating mostly plant based (your recipes were great for this!). I’m curious though, will this be something you’ll start including with all of your recipes, such as the ones on the blog? This looks amazing! You’ve poured so much into this project for your readers! Thank you! :-) Cannot wait to get my own copy! I’m so excited for your book! However, I haven’t received a response to a comment and an email I sent asking if you would be offering your new cookbook as a digital version to purchase through your app. I would much prefer to buy it through the app if it will be possible to do so. If not I will purchase the book. Thanks! Hi Fiona, Unfortunately, no, the cookbook won’t be offered through the app–but that’s a cool idea! You can buy the electronic version through Amazon (Kindle), Kobo, and Nook via the links provided on my blog, though. Hope that helps! I pre-ordered a while back, but it’s great to see photos and more information! I will be so glad to have the nutritional information as it’s not often I don’t have to calculate it for medical reasons. I have so many recipes I’ve yet to try because of needing to do that. Will it be printable? Congrats on the new book and on your second baby! Hi Heidi, Thank you so much pre-ordering! I really appreciate your support and enthusiasm for the new book. :) I’m not sure which format the nutritional info will be posted in yet, but I will look into making it printable! Can’t wait! Seems like it will be the perfect addition to my plant based library as the days get a bit shorter and garden produce is abundant! Congrats on the new book. The pictures look beautiful and I can only assume the recipes are great as well. I’m looking forward to getting it and making some delicious meals. This looks wonderful! I have visited your blog for quite some time now and was quick to purchase your original cookbook. Love it! Have turned my meat eating cousin onto some of your recipes with great success! I am looking forward to your second cookbook as your teaser recipes look fantastic. So happy to see you being successful in your work life as well as your personal life. Good luck with the cookbook launch and more importantly, good luck with the new addition to your family. Thanks for the congrats & love, Akino! I hope you love this next cookbook, too. Thanks, Anna! I love your enthusiasm for the new book, it’s so awesome to see! Congratulations, Angela. The book looks fantastic! I can’t wait to have it in my hands. Will the English version of the book which launches September 6 also contain metric measurement equivalents (like the app)? Thanks for the congrats, Sandra! Yes, the cookbook provides metric measurement equivalents, just like the app. Yay, so excited for your second cookbook Angela! I’ve pre-ordered it about a month ago and am counting back the days until its release!! 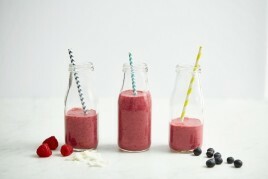 Gorgeous photos, and can’t wait to see and try all the new recipes you’ve developed!! Just a question: I’ve seen you mention that this time around the US and Canadian covers will be the same regarding design and quality. Why? Were there some quality issues with the first cookbook? I’m so excited!! However, I have not been able to pre-order on Amazon UK, it just says it is ‘unavailable’ ? Hi Nicki, we’re looking into this now! Thanks for the head’s up. Hi Anna, We’re currently looking into pre-order bonus options! I will be sure to keep you all posted. :) If you order now, you’ll still be able to get it (just keep your receipt handy). Thanks so much for your lovely words – I hope you love cooking from the new book. Congratulations ! I rarely buy cookbooks but I have your first one and will definately buy this one! Your recipes are amazing ! Thanks so much for the congrats and all your support, Carolyn! I hope you enjoy the second cookbook as much as you have the first. Done, I just preordered your book and I’m really looking forward to get my hands on it and start cooking… So glad that through BookDepository it can be sent to Italy with free delivery! I’ve been following you since 2009 and you are such an inspiring woman. 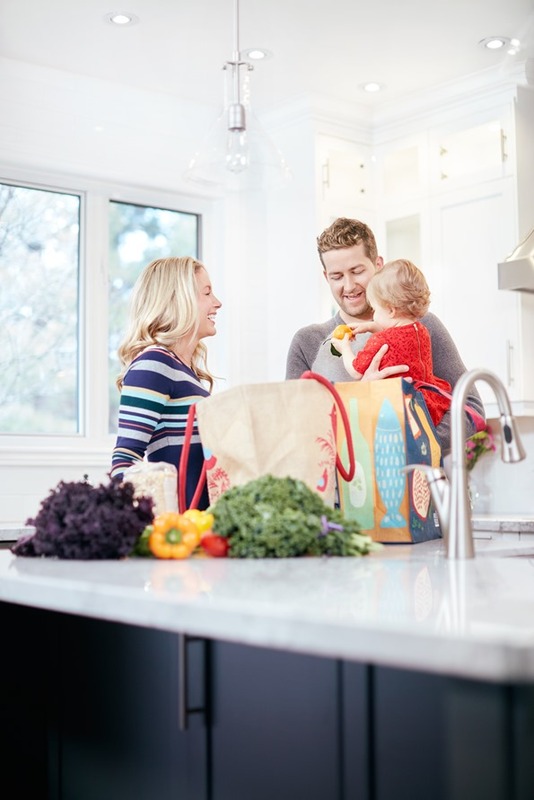 I have two little kids and last year I left my corporate job to start my business as a nutritionist, so I guess I can relate… Thank you for your amazing work! Wow, OSG Every Day is making its way to Italy!! Thanks for your support Elisa. I hope you love cooking from it. Also, I think it’s pretty amazing that you’ve followed my blog for so many years!! That deserve some kind of reward or something, heh. Good luck with your new business as a nutritionist. It sounds like a great fit for you! 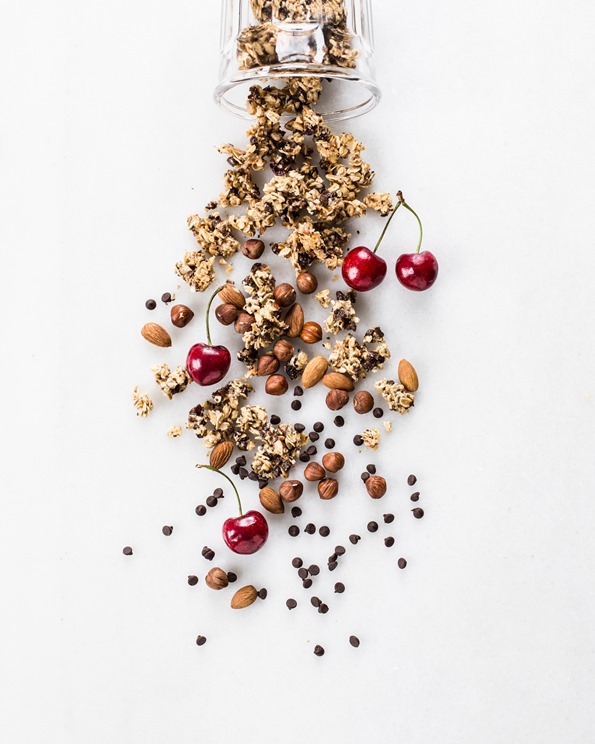 Your food photography is some of the best I’ve ever seen! Congrats on your book, can’t wait to get my hands on it! Thanks so much for the congrats and kind words, Julia! Congrats on the beautiful cookbook! I loved testing recipes and I know several people who can’t wait for the book to be released. I’m looking forward to sharing it with everyone when it is released! Thank you so much for your help with testing, Audrey! I couldn’t have done it without you guys. :) I’m so happy to hear you’re excited about the release! Take all my money! Haha seriously, these dishes look amazing. I was lucky enough to win your first cookbook in a raffle, but I am happy to pay for this one! I appreciate that it comes in softcover for a reasonable price. Hi Rachael, Thank you so very much! I truly appreciate that you took time out of your day to write such a thoughtful note. I’m so grateful for your support, and happy to hear that you love the first book and app so much! I have to be honest…I barely finished reading the title and I was already on the Indigo site to pre-order. :x Your first cookbook was so great, even my very, VERY meat and potatoes father enjoyed the recipes I made! Aw, thank you Elle!! I hope you (and your father! haha) find this next cookbook a hit, too. Fabulous! Pre-ordered mine in both digital and paper copies. I have both formats of your first book and love that I can bring it up digitally on my phone if I decide at the last minute I want to make a recipe. So excited to hear of this new book coming soon. Love that it will have nutrional information as well as pantry info. I’m so glad you’re looking forward to the new book, Heidi! I’m super happy to let you know that the pantry section will include storage, selection, and preparation tips. I had completed the order before I even got to the email of your blog post! Roll on September!!! This book is the is added to my wishlist, i got to find out how to make that burger it looks too delicious. Such wonderful inspiration with your photos and lifestyle. About to order mine now! Pre-ordered! Super excited! Congratulations. Can’t wait! Thanks Ashley! I’m so glad you’re excited for the new book (I am too!). Looks beautiful, Angela! I’ve been loving the first cookbook; can’t wait to pick up the next one! Looking forward to the new book! Your hard work & that of you team is greatly appreciated! Oh my goodness how incredibly exciting! I am currently trying to do an e-book on how people can start the journey to being vegan and this is seriously inspirational! 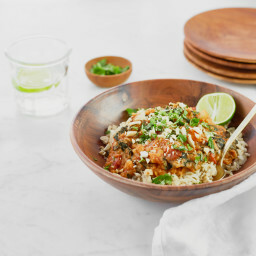 Your recipes always astound me and I am so amazed by your work on this blog! So happy for you and I cannot wait to get my copy! Thanks, Annie! I’m wishing you all the best with your e-book. Your first book is the BEST COOKBOOK I’ve EVER HAD! I really cannot overstate this. It’s my favorite. I’m in love with it. Sometimes I bring it to the grocery store with me as a substitute for a grocery list since I can cook out of that thing ALL WEEK! I’m SO PUMPED for your next cookbook! Thank you for creating such amazing recipes and gorgeous cookbooks!! Oh, that’s so exciting! I’m going to pre-order right away! I’m so excited about your new book, and looking forward to enjoying the delicious recipes that will no doubt fill my belly! I have the first book and the app and I love them so much that I recommend them to all my friends and family. My sister loves her copy that she got for Christmas and my kids and husband enjoy every no-fail recipe I make. Thanks for showing me that cooking plant based doesn’t have to be hard or yucky! Thanks so much for the congrats and your kind, heartfelt words! This cook book looks amazing and i’m so excited.. I love making your recipes and sharing them on instagram..:) I was wondering if there a page on the best veggie broth? cause i can’t seem to get past the water down tasting broth… Is there a trick to it? Hi Ashley, Finding a vegetable broth you love can be tough, for sure! I tend to buy low-sodium, and generally stick with the Imagine Organic and Pacific Foods brands, but I’ll be the first to admit that it’s what I add to the broths that really dazzles my taste buds (spices, veggies, and seasonings galore!). 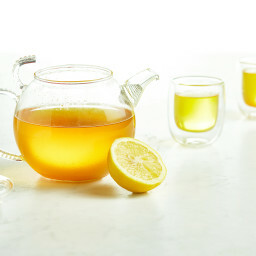 Vegetable bouillon cubes are another good option: They can be dissolved in water to make a quick broth substitute, with the added bonus of having a long shelf life and minimal packaging. Alternatively, if you’re in the mood to make veggie broth from scratch, I provide a delicious recipe for Homemade Vegetable Broth in my first cookbook (on p. 299). You can make batches of it to freeze, so you have it on hand whenever you need it. Yes!!! I’m so excited. I’ve loved everything I have made from your first book. PRE-ORDERED, can’t wait!!! Thanks, Addie!! Hope you love the new book just as much. I’m not usually a cookbook kind of girl. I generally prefer the flexibility of mixing and matching recipes from various online sources. But, being newly vegan, I’m pretty gosh darn excited about the fact that I just pre-ordered your book. Can’t wait for it to show up on my doorstep! I cannot wait until this cookbook comes out!!! I’m in love with your first cookbook. All your treats are my go to recipes all of the time. I use your recipes and ideas the most!! – No one ever can measure up– I always tell my husband- OSG did it again! LOL!! All the ingredients you us is how we live- amazing! You are awesome! I pre-ordered this cookbook for my mother in law for Christmas and myself! – Does it arrive within the week of 9/6/16? Hey Nicole, Thanks so much for your support, and the kind words! I can’t say for sure when it will arrive as I think your location impacts how long it’ll take to ship from the warehouse, but I have heard a rumour that sometimes pre-orders arrive a bit early. I’m not sure if that’s true or not though! Either way, it should be quickly after it releases into the world, heh. This cookbook looks great. A friend recently told me her teenage daughter had decided to go vegan (they eat meat daily), and I sent her a link to your site, to help everyone out. I said her daughter should take on cooking once a week for the family, instead of always eating something different. I thought of getting one of the cookbooks as a gift, do you think one is better than the other for new (vegan) cooks? I was thinking this one with all the adaptation possibilities. I just pre-ordered! Can’t wait for it to be released. I use your first cookbook all the time. Lately I’am interested in Vegan foods too. I was looking for some recipes over the web. Tound this one“HAKKA NOODLES” one day. Seams cheap and tasty. Must try. Thank you so much, Beata! :) It’s so wonderful and humbling to hear you find me an inspiration. I hope you love the new book when it’s out. I pre-ordered a few weeks ago and can’t wait for my new cookbook to arrive. It’s publication date is my son’s tenth birthday. This week, I made the Long Weekend Grilled Salad and brought it to lunch for work Tuesday and Wednesday. Today and tomorrow is the ultimate green taco wraps. I love plant-based eating! Thanks so much! I’m not sure if this is the right place for this comment, but I was wondering if you’d ever consider doing a post on your office decor & furniture?? Your snaps of it made me so envious! My husband and I are re-doing our office as well and are looking for stuff with the exact same colour scheme. Anyway, really looking forward to receiving your cookbook soon, love all your work! I can’t wait for your new cook book to come out!!! I absolutely love the Oh She Glows Cookbook. I’m slowly cooking my way through the entire book and have loved each and every thing I’ve made so far! Congratulations and I can’t wait to get this sometime soon. Thanks so much for the congrats, Sam, and the sweet comment! It’s so lovely to hear you’ve been enjoying my first book, and I hope you like the second just as much. I can’t tell you how excited I am for your book! I already have a feeling that I will want to try everything. Congratulations on the new book, Angela! I recently need to make dietary changes and your recipes have helped me immensely! I have yet to embrace the full vegan kitchen but your creativity with plant ingredients definitely persuade me! Looking forward to trying the new recipes! I am sure they are going to be awesome! Wow! The photography is beautiful and the food looks incredible as always. Through the past few years as I have transitioned from vegetarian to vegan, this is the blog I come back to most often for myself and where I send curious family and friends. Thanks for everything you create for us! Thanks so much for the kind words and for sharing the love, Krista! I just bought this book and I adore it. have already started using the effortless vegan overnight oats this is what I eat daily! Love it.The only problem I have is that there are no calories mentioned with anything and since I am watching my weight I want to see calories! also your index is very weak. if there is something I want to look up the index is no good for any particular veggie. otherwise I love all the recipes in it…I love it that you mention arrowroot. I have been using this for years! i don’t do whites…no flour no sugar etc. Hey Nancy, I’m so happy you’ve been enjoying my first cookbook! I’m a big fan of the Effortless VOO, too. :) And, I’m excited to be able to let you know that for this next book, the nutritional information will be available! It will be up on the website by the time the book launches in September. Congrats on your new book! It looks amazing! 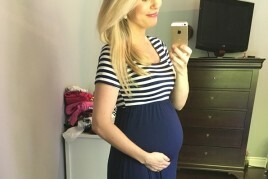 You’re looking radiant and beautiful during this second pregnancy! I pre-ordered your book on March 3rd. It is supposed to arrive on September 6th which seems not soon enough :); but will be here before I know it. I made the Empowered Noodle Bowl, it was so yummy! I just shared a pic on Instagram and tagged you! Angela I loved your first book and I’m excited for the second one. My only concern is that the first book completely fell apart, almost immediately after I bought it — I really hadn’t even used it much and pages began falling apart. I have had the same problem with one or two other vegan cookbooks and am wondering this is because of the glue/binding options chosen. Is this something you have worked to improve for the second book? Hi Marilyn, I’m so happy to be able to say: Yes, we have! This second book will feature an improved, sewn binding that is super durable, especially for “everyday” use! I’m a recent convert to a plant based diet! I have been enjoying your recipes so much! 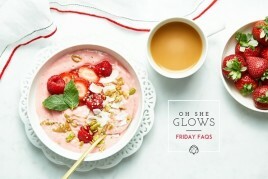 I love the Oh She Glows cookbook! You have shown me that vegan/ plant based cooking can be flavorful ,healthy and delicious ! I have pre ordered the new one already! Even my husband – a devout meat eater, has been enjoying some plant based dishes! I still haven’t told him that those Jumbo chocolate chunk cookies he devoured recently were vegan! Delicious! Thank you for sharing your talent and passion for cooking! Thanks for the heartfelt comment, Lynn! I’m so happy you’ve been enjoying the cookbook, and I hope you enjoy the second one just as much. Happy cooking! I just want to say, that as an “Almost Empty Nester” and I am learning So muuuuch from you!!!! This is such an exciting adventure for me at age 51. `I love your cookbook and am definitely going to buy the next one. Thank you so much!!!! Hi Angela, Congrats on your 2nd cookbook. It looks amazing! Can’t wait to get a copy of it! I’ve recently done a review printed on the Chinese version of your first book while I was promoting my own 2nd whole food-based Chinese cookbook in Taiwan. I am sure it’ll be a hot sale there. The Chinese readers will be thrilled to learn that you’ve had the 2nd one out already! Thank you so much for the kind words and support, Pei! :) I hope you love the second cookbook just as much as the first. Hello Angela, congratulations on your new book! I fell in love with your first one, at it’s actually the only cookbook i never let out of my hands again. I almost cook your recipes every day, they’ve made veganism so much fun for me! One question: Do you know yet if your second cookbook will also be available in german? And if yes, when? It makes finding ingredients so much easier for me, but if I have to wait too long i will buy the english version instead :) Thank you! Thanks for your support, Gloria – I hope you love it! Are there the same recipes from your first book in this one or are both completely different just brought your new one love it so much but want to make sure before buying your first book that they don’t contain the same things. Hi Emma, I’m so sorry for the delayed response on this! I hope you’ve been enjoying Oh She Glows Every Day so far. :) The recipes are different in each book, although some recipes in both do also appear on the blog. I hope this helps! I have both of your books and I love them, and so does my meat-eating husband! He’s also battling cancer at the moment and is very conscious about what he eats. I’m a piano teacher so sometimes after a long day of teaching into the evening it’s far too easy to reach for something quick and unhealthy. I enjoy your books because they’re very realistic and delicious! Hey Jennifer, I can’t thank you enough for the kind words about the recipes and books! My heart goes out to your husband. I’m sending him strength and healing vibes! Hugs to you both. 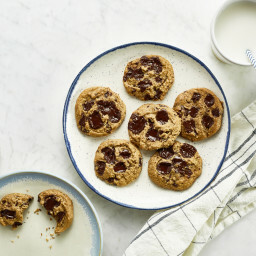 Previous post: Friday FAQs: Edible teacher gifts, festive Canada Day recipes, large-flake coconut whereabouts, and more!